education of students with emotional and behavioral disorders. 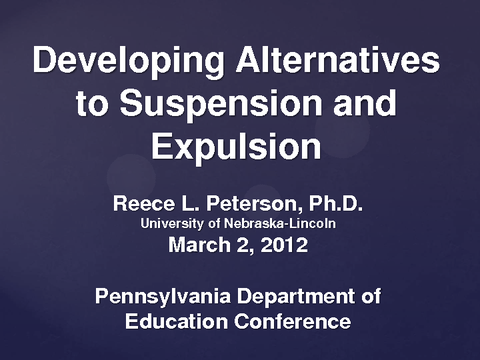 He teaches undergraduate and graduate courses related to student behaviors as well as special education administration. Dr.
accomplishing discipline. And of course, in just a few minutes, I'm going to ask you whether or not your school discipline procedures and policies are actually accomplishing these purposes. the nature of detention varies. The ones I was familiar with is more like a study hall where -- at least at the secondary level, where kids are expected to do homework or work quietly. code suspensions in her 3500-student school population to more than 700. So 700 dress code violations, presumably resulting in suspensions, for things like having your shirttail un-tucked. videos or CD's that kids could watch on a particular topic. They might include activities that students could create such as a report, oral report, or written report, something like that. simplistic here, but think to get the idea. Okay, how many of you have something like this going in one or more of your schools? Yeah, there are several, five or six across our group here. could say the same way. Well, the worst possible driver who doesn't care, drives without a license and everything, that course, the driver's course is not going to stop that behavior, right? more than enough. Absolutely. Yes, thanks. Yes? AUDIENCE MEMBER: At the elementary level, I had some schools that did this that found parents understood more of what was going on in class. conduct as an option for disciplinary consequence, not for all discipline, but for the ones where this might be appropriate. How many of you have experimented with something like this? in-kind, and obviously I think we're more concerned with in-kind types of restitution for certain offenses that happen in school where the student could be asked to restore the environment. programming. This one is changes in the student's schedule, classes, or course content, assignment to an alternative school or program, independent study or work experience programs. but that's not what we're headed for. We want an environment that is a deterrent on the one hand, but a deterrent that results in some positive progress and change in the student's behavior. student behavior, preventing other students' behavior, making a safe environment, maintaining the decorum of the schools, with these kinds of consequences more than we would with detention? about what's going on. And I know that we're all sick and tired of the D-word, but we do need to do this and it needs to be related to behavior. Actually, much of this is already available. basis or whatever makes sense in order to make sure that there are changes that are occurring as well. Okay, here's a list of all the different kinds of data that we might want to gather. Some of them I didn't mention. Environmental expectations in that school, the perceived needs that people have, you know, what's wrong with the school environment, and so on and so forth. and support, PBIS, approach. And usually there is a discussion about the school-wide values that are created in a PBIS school. That's one way of doing it, but there are other alternatives. willing and able to back off. You know, my famous song from another context is The Gambler, which has the words in it, know when to hold them, know when to fold them, know when to back away. just creating a conversation and a better level of understanding between the two parties. Again, a lot of it around homework issues. Okay, I'm getting there. Positive office referrals. these are kids that are giving us signals already that they're in trouble. We need to find those signals, use them, and then do something about those signals as quickly as we possibly can. been from someone out east. I'm sorry, out in the western -- in Oregon, but the idea is create in your own mind a picture of your school discipline system and how clear that is to everybody. doing? How many of you would say that -- I'll ask two questions. One of you -- how many of you would say you have a great foundation in place in your school, these foundational elements? order to succeed [inaudible]. REECE PETERSON: Yeah, great point. Well let's see. Of course, if we identify problems and those are serious enough, we should consider referral to special ed. you'll have some things to take home and do next week. Thanks.